Grab your friends or that special someone and get ready for three hours of fun on the waters of Philadelphia! This dinner cruise includes amazing DJ entertainment and views of the magnificent skyline. Enjoy a delicious buffet dinner as you gaze upon a beautiful view of Philadelphia's twinkling lights. This is an amazing way to experience Philadelphia's waterfront! This three-hour dinner cruise allows you a great night out -- dine on an all-you-can-eat buffet and watch Broadway-style entertainment. 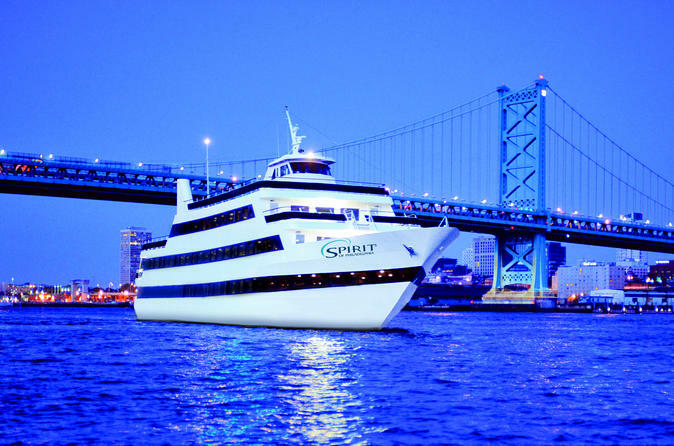 Then, gaze at the Philadelphia skyline from the outdoor deck and dance the night away in the boat's nightclub! A special evening awaits as you step aboard the elegant decks of your ship and are escorted to your candlelit table. Many tables are designed for cabaret-style seating with other guests, reminiscent of ocean-going cruises, so be prepared to chat and maybe even make some new friends. After you cast off, relax as you begin your three fun-filled hours on Philadelphia's harbor. Your waiter will invite you to the dinner buffet, where you can sample a little bit of everything or just select your favorite fare. The cuisine is freshly prepared in the shipboard galley and served as an elegant cruise buffet. Savor your culinary selections over dinner music and a never ending view of the city's breathtaking skyline through the panoramic windows. While you enjoy your meal, you'll be entertained with live performances. Later, head to the top deck to take a romantic stroll or hit the dance floor as the DJ spins the hottest tunes.